The UK’s first online skills hub, www.skillexchangeni.org, has gone live in Belfast following a successful pilot in Ballymena. Skill Exchange NI is the UK’s first ‘joined-up’ regional employer-to-employer network aimed at sharing skill and expertise through a Not for Profit programme. Employers of any size and sector, free of charge, can connect directly with a range of experienced professionals in a variety of local, regional and national industries and organisations. The service is being rolled out across five regional hubs centred in Belfast, Ballymena, Craigavon and Derry/Londonderry. Funders include Dunbia, Harland & Wolff, JTI, Michelin, Moy Park, Northern Regional College, Ulster Bank and Wright Bus. The decision to form the first hub covering County Antrim/North East last year followed a presentation given by Skill Exchange UK to a group of MPs at Westminster. 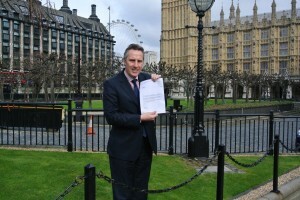 The presentation gained the attention of Ian Paisley, MP for North Antrim, who followed up with a series of meetings in London and Ballymena. Rachel Doherty, HSQE Manager of GES Group, agreed, saying: “The Skill Exchange Hub initiative is a fantastic business development and support tool. Michelin Ballymena had always considered supporting small and medium sized companies as part of their corporate and social responsibility, according to Kathy Simpson, Factory Personnel Manager. Philip Flaxton, Chief Executive of Skill Exchange UK, said employers stood to benefit from a wide range of activities such as knowledge sharing, skill development and retention, role placement, work experience, resource sharing, training and business mentoring. “Skill Exchange NI, which we now plan to replicate throughout the UK, provides a regional strategy which allows the entire employer community an extended umbrella under which to access opportunities without location barriers,” he said. Ballymena Skill Exchange hub holds event in Michelin Athletic club. This week the very first skill exchange hub in the UK, Ballymena hosted an information event for local businesses to find out how they can benefit from joining. The hub was launched last November by the founding partners – JTI, Michelin, Moy Park, Wrightbus, Dunbia and the NRC in conjunction with the Ballymena Council and the Chamber of Commerce. The hub, which is funded and maintained by the partners provides a free skills and training outlet for local SMEs looking to enhance their businesses. Employees may be seconded into other organisations for free training and advice. The event last Wednesday night was a roaring success and facilitated potential joining of ten more members to the Ballymena hub. It was also attended by Ian Paisley MP and our new town Mayor Audrey Wales, both of whom have supported the hub tremendously and helped found it from the outset. “This skill exchange hub is revolutionary in how we should now think of developing our businesses around Ballymena and North Antrim. I’m delighted that so many companies turned out on Wednesday night to find out just how their business can benefit enormously from being a member of the hub. I must also thank the founding partners, who not only funded the hub from the outset, so that others in the area can use it for free, but who continue to support and attend these events to help local SMEs grow and prosper their business. On Wednesday 5th June 2013, the Ballymena Skill Exchange hub is hosting an event for all businesses in the local area to find out how you can benefit from joining the hub and using it for absolutely no charge. The event is being hosted by the founding partners of Skill Exchange UK – Michelin, JTI, Moy Park, Wrightbus, Dunbia and the Northern Regional College and the hub has been financed by these companies for all in the area to use for free. You are invited to come along and find out how your business can benefit from a range of free resources, training materials, staff secondments and much more. There will be people on hand from all founding partners to explain how your business can take advantage of the hub. The meeting takes place at Michelin Athletic Club from 530pm – 730pm. Boris backs Ballymena Skill Exchange – Now open for FREE to all businesses in Ballymena area! London Mayor Boris Johnson has written a letter to our local MP, Ian Paisley, giving support and encouragement to the UK’s very first Skill Exchange UK hub, right here in North Antrim. The hub was launched in November of last year by Ian Paisley alongside some of Ballymena’s major employers, the NRC, Ballymena Borough Council and Ballymena Borough Chamber of Commerce and Industry with the objective of improving skills, driving employment and increasing competitiveness. The hub is now open to all businesses in Ballymena, Ballymoney, Coleraine and around the North Antrim area, and is 100% free of charge and ready to join. Funding partners JTI, Michelin tyres, Moy Park, Wrightbus, Dunbia and the Northern Regional College have taken it upon themselves to create an innovative and exciting skills hub for the area, through which they hope to generate more business and expertise for the area. “What our local employers, the NRC, Council and Chamber of Commerce have done for North Antrim is absolutely phenomenal. They have created an absolutely free, ready to join skills hub that has a tremendous array of skills and information that all businesses in the area are now able to benefit from right away.